We've packed cricket bats, bikes, kayaks, boogie boards, skim balls, wet suits, tennis racquets, totem tennis, kits, roller blades... the car is overflowing with stuff to keep us busy and active and having fun ...but what I'm secretly looking forward to the most is some time on my towel reading a book with my toes in the sand and breaks for swims and icy pole. Q&A a day for kids is an activity book we've been doing for the last month or so - it last 3 years and every day the kids answer a prompt - good fun - and creating memories as we go. Life after Life - I really like Kate Atkinson's style - clever and entertaining - and a groundhog day theme - should be good. The signature of all things - I loathed Eat, Pray, Love but so many people have recommended this that I couldn't resist - I hope I don't regret it! Burial Rites - I think I must be the only person I know who hasn't read this yet - based on a true story with guaranteed tragic ending - I see tears coming. What's in your summer reading pile? Any recommendations for me? I finished Burial Rites not long ago. It's not what I normally read, but I was super curious about it, it seems to be the 'big thing' at the moment and the author is South Australian. I really enjoyed it, much to my surprise. Great characters and pace, plus description that paints pictures in your mind with ease...or at least, that's how I found it! Anyway, hope you had a great Christmas, Ally, and have lots of fun on your holiday! I'm sure Christmas won't mind being packed up early in your house, it's probably going to last all January in some. I know one year (since no one likes the job of packing up the tree) it stayed up till the end of January. Ooh, I will also be interested to know how you like "The Signature of All Things" as I have heard so much about it! Didn't know it was bad luck to pack up early!! I still have one decoration out…..surely that makes it OK! 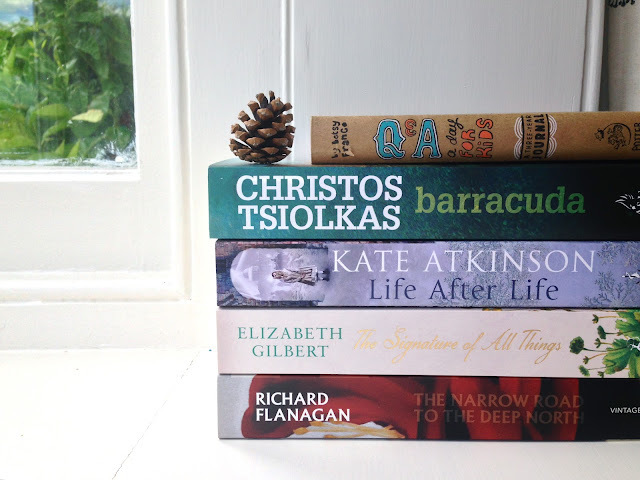 I've heard wonderful things about the Flanagan, Gilbert and Tsiolkas - I'm very keen to read each of them. Be great to hear what you thought of them when you're done!